This keyless remote programming instructions work for 3B remote with part # 88959920, 10205241, 10205239, 10205240, 12522338, 10063533, 10205239, 12522337, 12522339, 12522356, 10097895, 10097894, 10205674, 10092854, 10097894, 10063534, 10178738, FCC id ABO0103T, GQ43VT1, ABO0104T, ABO0116T, and part # 218 K1200 on the back of it. 1. You need to have an access with Programming Connector before you can program a new/existing remote. It's a plastic connector with 2 wires up to it and not connected to anything. You may have to pull the trim back to access it. 2. 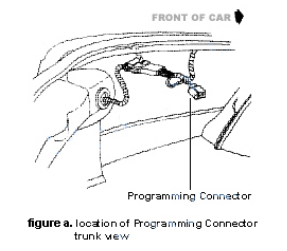 Most programming connectors have 2 terminals. Connect both of them by using jumper wire. After doing so, your door locks will cycle (lock and unlock) indicating the system is in programming mode. Note: Do not remove the jumper wire until step 5. 3. Press any button on the remote once. Door locks will cycle (programmed). 4. Repeat step 3 to add another remote. Door locks will cycle if it has been programmed. 5. Remove the jumper wire from the connector to turn off the programming mode.